The Small Oil Refinery is used to refine low grade fuel from crude oil. Each crude oil produces 3 low grade fuel. The cost of the refinery is quite expensive but can prove to be worth it's cost in the long run. 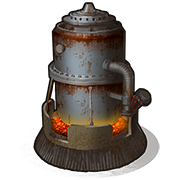 Note: As of January 18 2018, the Small Oil Refinery produces charcoal.